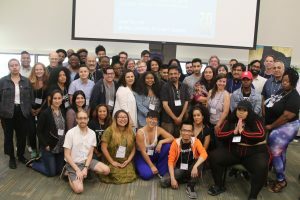 At a time when our communities and movements are under seemingly continuous attack, media justice leaders nationwide gathered at the Allied Media Conference in Detroit this June for an inspiring, cathartic, and ultimately rejuvenating week of community building. From our annual Membership Assembly on day one of the conference to the dozens of workshops led by members of the Media Action Grassroots Network (MAG-Net) throughout – culminating in our #MediaJustice Mixer – it was a powerful reminder of the knowledge, talent, and resiliency of this network, and all those fighting for racial, economic, and media justice today. For more, check out some highlights below and visit our photo gallery on Facebook. Stay connected with the media justice movement by signing up for our e-mail list!